THE LISTENER: Misfit and computer security expert Cornelia Markum hacks into a text conversation between unidentified Virtue Falls residents … and realizes she’s stumbled into a murder plot. THE RELATIVES: When relatives invite themselves to visit a wealthy couple’s Virtue Falls home, events take an unexpectedly dark—and fatal—turn. A DARK AND STORMY NIGHT includes previously unpublished extras from the full-length suspense VIRTUE FALLS, the alternate conclusion of acclaimed action-filled adventure OBSESSION FALLS and an excerpt of the newest Virtue Falls thriller, BECAUSE I’M WATCHING. These previously published Virtue Falls short stories are also available for purchase as singles. 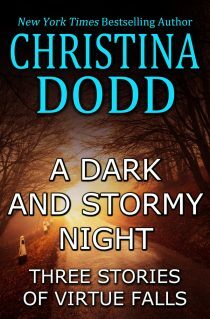 A DARK AND STORMY NIGHT is available now for Kindle, Nook, Kobo or iBooks. To keep up to date, please join my mailing list. Want a “Books by Series and in Order” page? It’s here. Want the printable booklist sorted by genre/series/in order? It’s here.